Still fresh from press I’m holding the annual review of the Styrian recording association in my hands. From point of view of a beef cattle breeder (especially a Simmental breeder) the results are very gratifying! The number of control herds in beef performance testing is inreased by 74 herds , whereas the number of control herds in milk performance testing is reduced. We have 20 different beef breeds in Styria. There are 124 Simmental herds (121 breeding herds) with 755 cows (747 breeding cows). 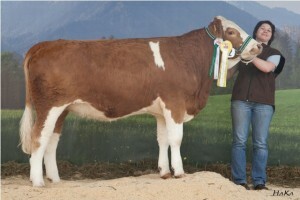 So Simmental is the second largest beef cattle breed in Styria after Murbodner. Daily weight gain of Simmental calves (200 days): males: 1259,1 gram female: 1090,5 gram. So Simmental ranks before Blonde d’ Aquitaine (m: 1048,4 f: 996,7), Charolais (m: 1206,6 f: 1057,6), Limousin (m: 1081,5 f: 1029,1) and all the other beef breeds! Simmental is also one of the best with 365 days: The daily gain amounts 1102,5 gram (males) and the females get 927,3 gram. Of course an increased performance would be desirable, but only Blonde d’ Aquitaine is better in both sexes (m: 1175,0 f: 928,8). Just the male Charolais are better (1183,2 gram) while the female ones gain 835,2 gram per day. And Limousin is behind Simmental (m:1041,8 f: 893,9). These resluts are very promising! And another step that Simmental becomes the number one beef breed in Austria.